The Simba Lighting G8 20W 120V Halogen Light Bulbs are made with high quality, for both indoor and outdoor uses in homes and offices. Common uses include overhead projection, fiber-optics, landscape lighting, floor lamps, ceiling lights, table/desk Lights, etc. These light bulbs are dimmable. When shopping for light bulbs, it is important to match the dimensions and other key specs to make sure you are purchasing the correct light bulbs. There are many similar light bulbs that look very similar to the G8 light bulbs so make sure to look at the specs carefully. The length of the light bulb is the shorter 1.38 inches and diameter is 5/8 inches. Please check your fixture to see if it will work for you before purchasing. 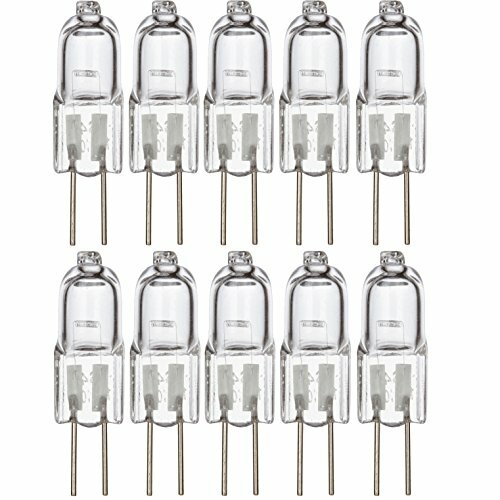 These bulbs work with 110V 120V 130V A/C voltages. The base is G8, which is bi-pin 8mm apart. The color of the light is soft white and the light temperature is 2700K. Average lifetime is 2000 hours and it can last switching on and off of about 8000 times. The Simba Lighting light bulbs are also RoHS and CE certified. No mercury content in the halogen bulbs, as opposed to other commonly used energy efficient light bulbs. 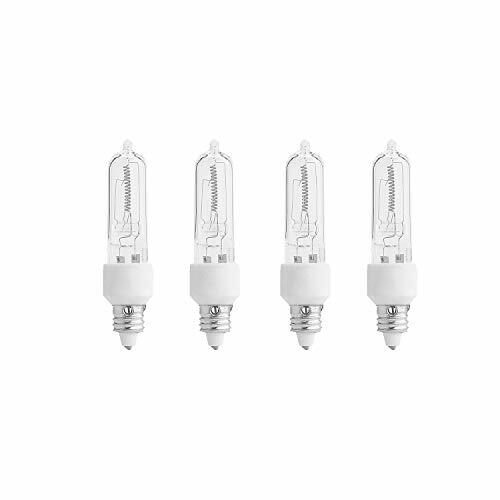 Halogen G8 Light Bulb 110V 120V 130V. 20 Watt. Soft White 2700K. 190 Lumens. Base G8 2-pin 8mm apart. Dimmable. Instant On. 2000 Hour Average Lifetime. Indoor & Outdoor Use. Commonly used in fiber-optics, landscape lighting, floor lamps, ceiling lights, table/desk lights. 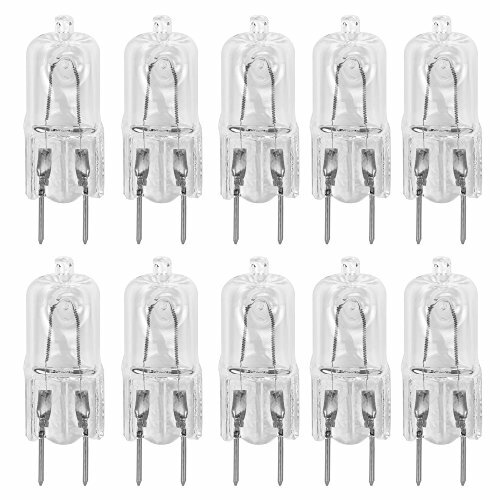 10 Pack Light Bulbs. RoHS and CE certified. Philips 50-Watt GU10 Indoor flood light is ideal for use in recessed cans and track light fixtures. They provide a crisp, bright white halogen light and are perfect for accenting your d cor. These bulbs should only be used in 120V enclosed fixtures. Warranty: LIMITED WARRANTY: Philips warrants that this bulb will be free from defects in material and workmanship for 2.7 years based on up to 3 hours average usage per day/7 days per week, when used as directed. If this bulb does not conform to the warranty, Philips will send you, at its election, a replacement bulb or refund upon receipt of the returned bulb, register receipt and proof of purchase. Please call our toll-free number, write to Philips or send an email at the website below to find out how to return the bulb. This limited warranty does not cover bulbs subject to accident, neglect, abuse,misuse or acts of God. REPLACEMENT OR REFUND IS THE SOLE REMEDY AVAILABLE. EXCEPT TO THE EXTENT PROHIBITED BY APPLICABLE LAW, ANY IMPLIED WARRANTIES ARE LIMITED IN DURATION TO THE DURATION OF THIS WARRANTY. LIABILITY FOR INCIDENTAL OR CONSEQUENTIAL DAMAGES ISHEREBY EXPRESSLY EXCLUDED. Some states do not allow exclusion of incidental or consequential damages, so the above limitation or exclusion may not apply to you. This warranty gives you specific legal rights, and you may also have other rights which vary from state to state. 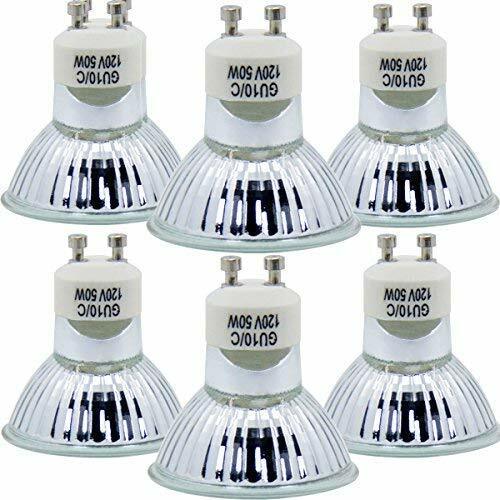 50W MR16 GU10 Base 120-Volt Halogen Reflector Flood Replacement Light Bulbs. 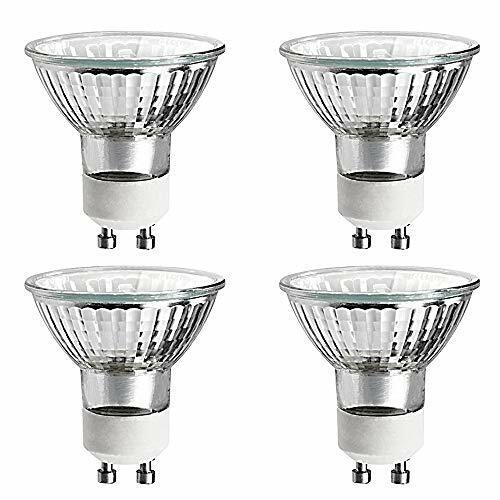 These are replacements for halogen light bulbs for many uses including ceiling lights, table/desk/floor lamps, cabinet lighting, closet lights, outdoor lights for home, office, restaurants, and stores. All bulbs are brand new and high brightness and long life. Applications: The Simba Lighting high output G4 bi-pin light bulb is an excellent addition to your home, office, garden and vehicle. 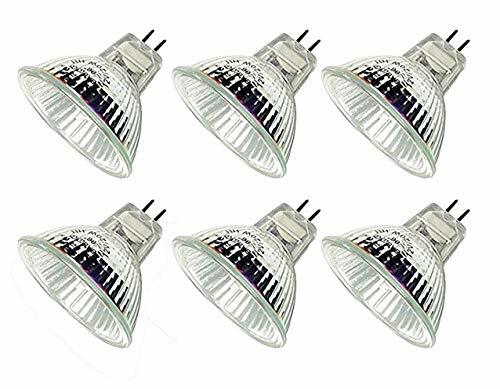 Often used for accent lights, under cabinet puck light, chandeliers, wall mounts sconces, closet lights, floor lamps, table/desk lights, track lighting, and lighting for landscape, RV, caravan, boats, yachts, etc. The G4 light bulb has omni-directional 360 beam angle. There is no mercury content and it is instant on! Eco-friendly and Energy Saving: This halogen light bulb takes 20W, giving 280 lumens of light. Assuming an average of 3 hours of daily operation and average cost of 11 per kW, the yearly energy cost is $2.4. High-Performance Quality and Excellent Light Color: The light temperature is 2700K, which gives very nice warm white yellowish color for superb ambiance. The color rendering index (CRI) is 100 comparing to low CRI LEDs so the quality of light is excellent. This halogen light is CE and RoHS certified to ensure high quality. Up to 2,000 hours of lifespan, which is 1.8 years with 3 hours of average daily use. 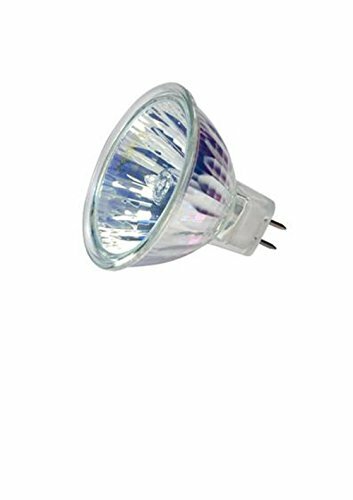 Product Specifications: Power: 20W Luminous Flux: 280 lumens Beam Angle: 360 Light Temperature: 2700K warm white Color Rendering Index (CRI): 100 Voltage: 12V A/C or D/C Dimmable Instant on Material: Glass Diameter: 0.38" (0.95cm), Length: 1.19" (3.0cm) Base: G4 bi-pin (4mm or 0.16" apart) No Mercury CE and RoHS certified Seller Warranty and Guarantee: Seller 90-day warranty. Just send us a message if the product malfunctions before 90 days after the purchase date. EXCELLENT AND SAFE LIGHTING OUTPUT: High Quality Eco-Halogen. Omni-Directional 360 Beam Angle. 2700K Warm White, CRI 100, No Mercury. Instant On. Dimmable! MANY LIGHTING APPLICATIONS: Often used for Accent Lights, Under Cabinet Puck Light, Chandeliers, Wall Mounts Sconces, Closet Lights, Floor Lamps, Table/Desk Lights, Track Lighting, and Lighting for Landscape, RV, Caravan, Boats, Yachts, etc. Insane high quality Tungsten filaments for maximum and prolonged lifetime - rated up to 3000+ hours with over 85% brightness at end-of-life. Direct Replacements For All G9 Light Fittings And Sockets - Feature 2 Looped Prongs That Are Spaced 9mm Apart - Premium Quality Tungsten Filament - Utilizes the Halogen Cycle And Outlasting Typical Incandescent Light Bulbs In Lifetime And Brightness. High quality tungsten filament for maximum lifetime - rated up to 6000 hours with over 80% brightness and end-of-life. When installed - Halogen light bulbs are a great way to save on heating cost during winter , as the heat generated can contribute to the ambient temperature. For the utmost peace of mind and longer-lasting light bulbs - think 12Vmonster and choose the 12Vmonster Halogen G8 now! 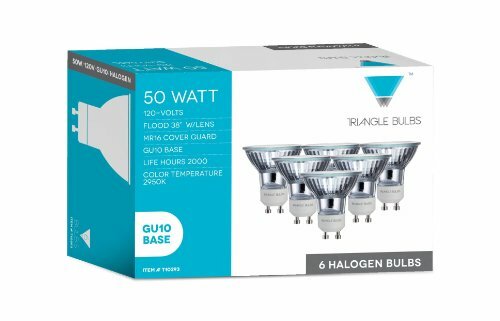 GU10 Halogen Reflector, Indoor Flood 50 Watt MR16 GU10 Base 110Volt-120 Volt Light Bulb, Flood Replacement Light Bulbs.Suitable for multiple applications and perfect for using in indoor recessed cans and track lights. 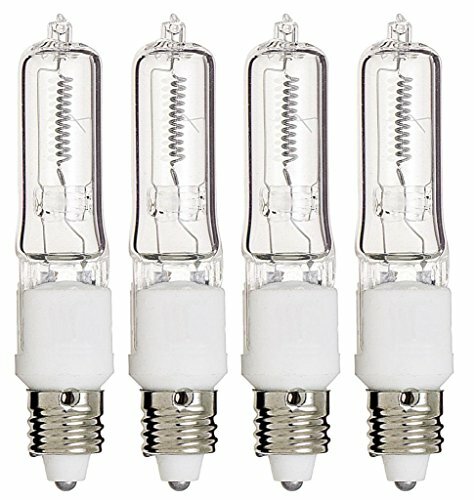 50W /110V-120V/GU10 Twist & Lock Base, Halogen Light Bulbs, Warm White , Clear Glass. Item Size: Diameter 50mm, Height 54mm (include the pins' length). Suitable for office, dance hall, bar, exhibition, Art galleries and Entertainment lighting, home decor, etc. Life for Exceed 2000 Hours, 100% Satisfied Guarantee, One year warranty. This dimmable, 39-watt bulb creates crisp, soft white lighting for inviting indoor or outdoor living spaces. Versatile for multiple applications, this 2900-Kelvin bulb is ideal for use in indoor recessed cans and track lights, as well as outdoor spot light fixtures. Dimming feature makes it easy to create the right ambiance for any activity. Features a Medium Screw base. Flipping the switch immediately lights your room to full brightness; no slow starting or waiting. Philips reuses as much glass and packaging material as possible, reducing environmental impact. This bulb replaces 50-watt incandescents, with an estimated annual energy cost of $4.70 (based on three hours/day). This product ships as a 4-pack. 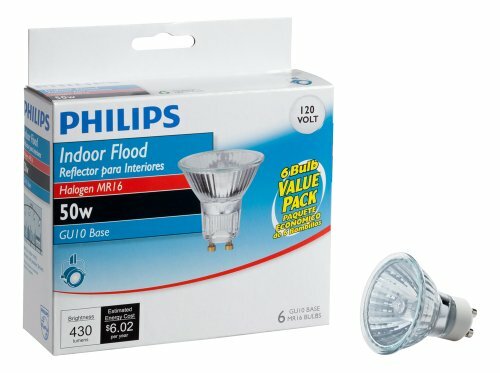 ENERGY EFFICIENT: Philips Halogen PAR20 Flood Light Bulbs have an estimated annual energy cost of $4.70 (based on three hours/day). SOFT WHITE: Philips Halogen Dimmable PAR20 flood light bulbs offer warm and comfortable lighting with high CRI (color rendering index). At 2900 Kelvin these bulbs deliver bright, crisp color ideal for recessed cans, track lights, and outdoor spot light fixtures. SMOOTH DIMMING: Philips dimmable bulbs are flicker-free, silent, and tested to work with more dimmer switches than any other bulb on the market. These PAR20 flood light bulbs smoothly dim from 2900 Kelvin down to a soft glow. ECO-FRIENDLY: These Philips PAR20 light bulbs use recycled glass and packaging material, reducing environmental impact. COMPATIBILITY: These Philips LED light bulbs fit in E26 medium screw bases. Not compatible with Philips HUE products. 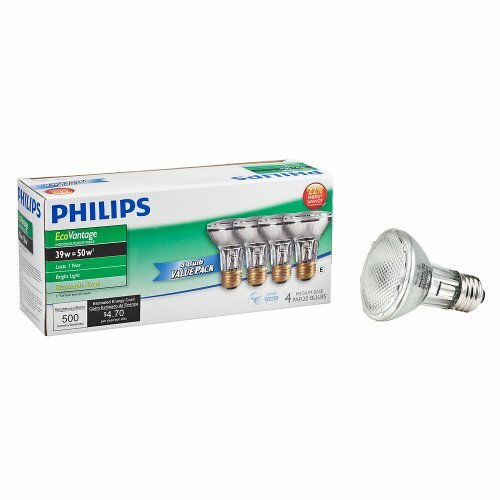 Philips LED Dimmable PAR20 light bulbs are for non connected use only. Luxrite Halogen Pin Base Bulbs are ideal for flood lights, track lights, recessed lights, display lighting, and other commercial and residential settings. It has a long life of 2,000 Hours and it works with all GU10 bi-pin sockets. 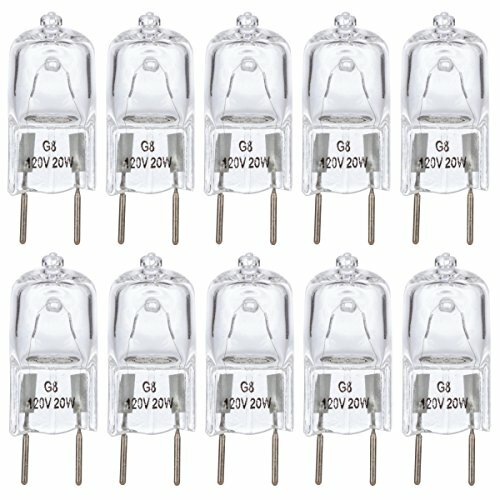 CTKcom 12Volt 20Watt GU5.3 base MR16 Halogen Light Bulbs Will be Good replacement halogen light bulbs. CTKcom Halogen Light Bulbs Will be Good replacement halogen light bulbs for multiple uses including: cabinet , closet , outdoor , security lights, home, Microwave, Oven , Hood , lamp , Recessed fixtures , office, under counter unit , ceiling lamp, stores , Torchiere Lamp , desk , under counter , floor , restaurants , schools , shops , household fixtures , Motion sensor lighting , under cabinet , indoor , ceiling fan bulb , outdoor , security , landscape . All bulbs are brand new and high brightness and long life. 2.Includes 6 pcs NEW Precision Halogen 12Volt 20Watt Halogen Light Bulbs. 1. 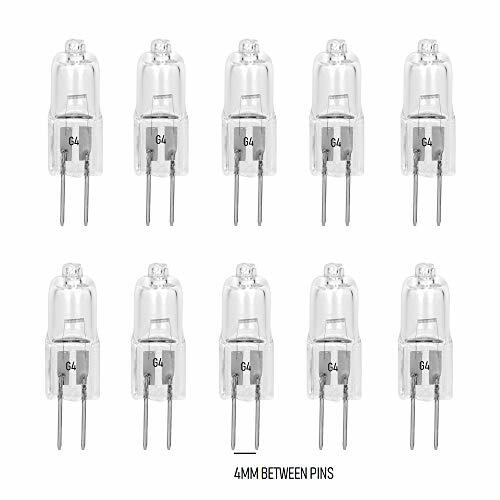 High Quality: Size(Diameter * Height): 2" x 1.8" (50mm* 45mm).MR16 GU5.3 Bi-Pin Base (2-Pin )(5.3mm Millimeters between Pins); High Brightness and Energy efficient CTKcom MR16 20W 12V Halogen bulb GU5.3 Bi-Pin Base,Includes 6 pcs NEW Precision Halogen 12Volt 20Watt Halogen Light Bulbs GU5.3 Bi-pin base. 2. Standard MR16 GU5.3,G5.3,GX5.3 Bi-Pin Base (2-Pin ) (5.3mm Millimeters between Pins);20W 12 Volts / With front glass cover (lensed ). 3. Long life:High brightness and low power consumption Provides Lasts an average of 2000 hours. 5. Mufti-functional: Perfect halogen light bulbs For Your Use for office, Stores, Schools, Landscape ,exhibition, home, hotels, museums, restaurants, retail shops/ Universal bulbs. Philips 50-Watt MR16 Landscape and Indoor flood light 3-pack is ideal for use in outdoor landscape fixtures and indoor track lights. They provide a crisp, bright white halogen light and are perfect for accenting your d cor. These bulbs should only be used in 12V enclosed fixtures. Light for all of your specialized fixtures. Philips Specialty Incandescent and halogen bulbs provide the perfect light for accent and display lighting as well as general lighting in a variety of applications. GE energy-efficient soft white bulbs have the same look, feel and nearly the same brightness as traditional incandescent, but with one big change: it now pays you back! 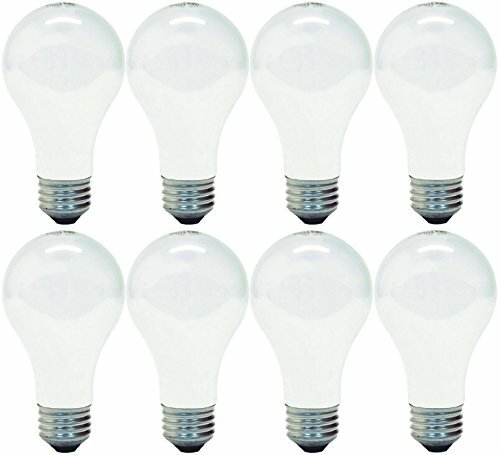 These bulbs use 28% less energy than regular incandescent, helping you save money on energy costs. Use general purpose GE energy-efficient soft white bulbs in common household fixtures like table lamps, floor lamps, enclosed ceiling fixtures and bare lamp sockets. 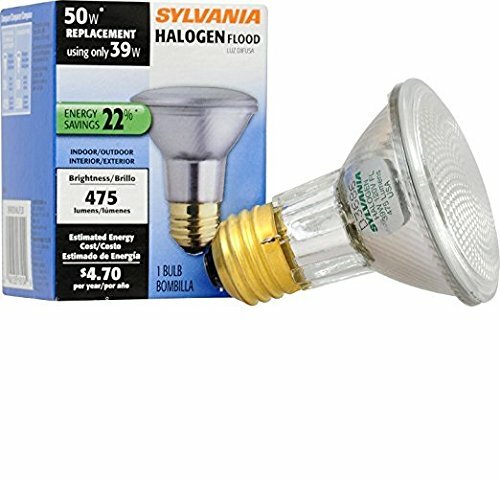 (Pack Of 2) 70PAR38/FL 120V - This KOR 70-Watt PAR38 120V Halogen Flood, is the familiar, classic halogen product that most homeowners and businesses use when they need high light output from small fixtures indoor and outdoor. The most common uses would be in track lighting, small recessed cans, over the range hood and outdoor lighting. Halogen PAR flood products provide bright, white light together with high color rendering. This versatile high-end light adds to the appeal of home furnishings, or calls attention to showroom merchandise. 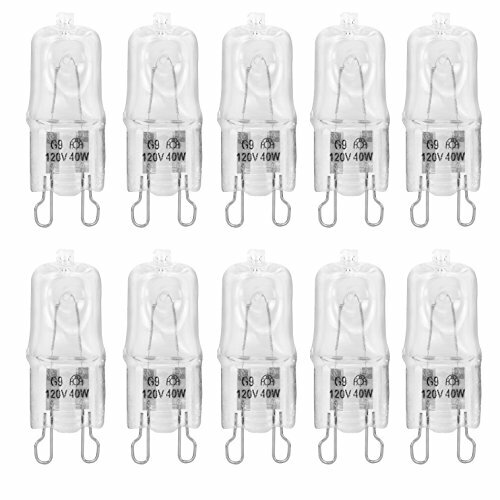 These Halogen PAR floods are a more energy efficient substitute for traditional incandescent floods. By design, the PAR38 will fit wherever the BR38 or BR40 fits, and the PAR38 also features the same great dimming properties. Halogen PAR38 floods have a lamp within a lamp construction. Inside the outer jacket that you see, there is a tungsten halogen capsule, which is the inner lamp. This is why halogen products are more efficient than standard incandescent bulbs. And, halogen products do not contain mercury, commonly used in some other types of energy efficient products. 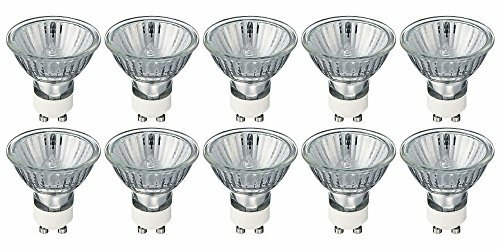 KOR halogen 70W PAR38 floods uses only 70 Watts and replaces the 90-Watt PAR38 - 90PAR38 with same lumen output making it a bright, energy saving alternative to standard incandescent light bulbs.- 120 Volt Halogen Light Bulbs. Direct Replacements For All G4 Light Fittings And Sockets - Feature 2 Prongs That Are Spaced 4mm Apart - Premium Quality Tungsten Filament - Utilizes the Halogen Cycle And Outlasting Typical Incandescent Light Bulbs In Lifetime And Brightness. This 50-watt floodlight creates a crisp, bright white lighting for inviting indoor or outdoor living spaces. Versatile for multiple applications, this 2800-Kelvin bulb is ideal for use in enclosed landscape fixtures, pendant fixtures, recessed cans, and track lights. Dimming feature makes it easy to create the right ambiance for any activity. Features a GU5.3 base. Flipping the switch immediately lights your room to full brightness; no slow starting or waiting. Philips reuses as much glass and packaging material as possible, reducing environmental impact. Estimated annual energy cost of $6.02 (based on three hours/day). Average life span of 2,000 hours. This product ships as a 6-pack. This 50-watt floodlight creates a crisp, bright white lighting for inviting indoor or outdoor living spaces. Versatile for multiple applications, this 2800-Kelvin bulb is ideal for use in enclosed landscape fixtures, pendant fixtures, recessed cans, and track lights. Dimming feature makes it easy to create the right ambiance for any activity. Features a GU5.3 base. Flipping the switch immediately lights your room to full brightness; no slow starting or waiting. Philips reuses as much glass and packaging material as possible, reducing environmental impact. Estimated annual energy cost of $6.02 (based on three hours/day). Average life span of 2,000 hours. This product ships as a 6-pack. 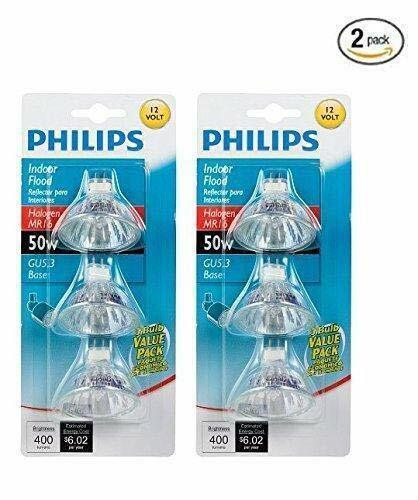 Warranty: Limited warranty: philips warrants that this bulb will be free from defects in material and workmanship for 2. 7 years based on up to 3 hours average usage per day/7 days per week, when used as directed. If this bulb does not conform to the warranty, philips will send you, at its election, a replacement bulb or refund upon receipt of the returned bulb, register receipt and proof of purchase. Please call our toll-free number, write to philips or send an email at the website below to find out how to return the bulb. This limited warranty does not cover bulbs subject to accident, neglect, abuse,misuse or acts of god. Replacement or refund is the sole remedy available. Except to the extent prohibited by applicable law, any implied warranties are limited in duration to the duration of this warranty. Liability for incidental or consequential damages ishereby expressly excluded. Some states do not allow exclusion of incidental or consequential damages, so the above limitation or exclusion may not apply to you. This warranty gives you specific legal rights, and you may also have other rights which vary from state to state. The light temperature is 3000K, which gives very nice warm white yellowish color for superb ambiance. E11 is 1mm smaller. The E12 in base diameter. SAFE LIGHTING OUTPUT: High Quality Eco-Halogen. Omni-Directional 360 Beam Angle. 3000K Warm White. Dimmable! LIGHTING APPLICATIONS: Often used for Chandeliers, Ceiling Lights, Cabinet Lighting, Pendant Lights, Floor and Table Lamps, Studio Lighting, Wall Sconces, etc.